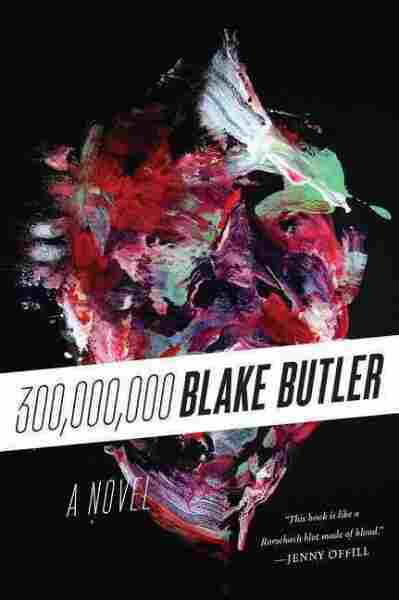 Book Review: '300,000,000' Blake Butler's new novel, 300,000,000, is not for the squeamish. This portrait of a serial killer and the detective who hunts him will curdle the blood — and possibly the soul — of any reader. Blake Butler's new novel, 300,000,000, is not for the squeamish. Then again, it's hard to imagine anyone whose blood won't curdle reading it. Or their brain. Or possibly their soul. "The mnemonic American mush" — it's one of many poetic turns of phrase that pepper 300,000,000. As with his previous books, like There Is No Year and Nothing: A Portrait of Insomnia, the Atlanta-based alt-lit author employs dense, gorgeous prose in the pursuit of dream-haunted darkness. But in 300,000,000, he goes darker still. The mush of memory that Butler uses to describe the collective American psyche — which, of course, is not well — also takes on a more tangible form: human flesh. 300,000,000 is, in short, a portrait of a serial killer. Gretch Nathaniel Gravey is the novel's Charles Manson-like cult leader, who slaughters hundreds of victims then piles them up in his home, which he dubs the Black House. And 3,000,000,000 is also a detective story — E. N. Flood is an investigator who's been assigned a sanity-challenging task: to decode Gravey's delirious, manifesto-like diaries. The setup is hideously gripping, but Butler doesn't linger there long. The structure of the book starts to break down, as if it's being mutilated alongside Gravey's victims; what begins as a dialogue between the killer's diary entries and Flood's analysis of those entries turns into fractured chorus of intruding voices. Various members of Gravey's homicidal cult, all of them teenage boys at the time of their conversion, inject their own reactions to Gravey's rapturous accounts of his murders. Other detectives begin rebutting what Flood has just written. Some are anonymous. Some impersonate each other or accuse others of impersonating them. It's like an Internet comment thread, only mutated into a book-length text that grapples with itself as it perpetually rewrites its own truths. The very existence of certain narrators is called into question — and then the existence of certain characters themselves. In that sense, 300,000,000 is excruciatingly self-aware. But those meta tendencies heighten the book's daring structure. Fourth-wall-breaking sentences surface here and there — "This is a book you are reading," "You are the only person who can read this," and most eerily, "There is no author," a statement that feels like a callback to There Is No Year — and they work in context while also drawing the reader in as a possible participant, as if the act of reading about Gravey's atrocities has somehow retroactively enabled them. It's tricky stuff, but Butler moves through his conceptual tangle with swaggering, fluid grace. Butler renders the foulest scenes with obscene lyricism, as if he were rhapsodizing at length about natural beauty or spiritual ecstasy. In fact, that's how Gravey views his own crimes; Butler ingeniously makes these passages more accessible (or more tolerable, depending on your threshold for grotesquerie) by interspersing them with the voices of Flood and others. That is, until the boundaries between all those conflicting narrators eventually blur into a deafening smear, forming another kind of mush. For all its slipperiness, 300,000,000 is devastatingly pointed. Its title is a clue: 300,000,000 is the population of the United States, rounded down, and Butler's chosen it for an unspeakably chilling reason. What begins as a detective story winds up morphing into an apocalyptic tale, but not like any apocalypse that's been seen in literature, despite a recent wave of doomsaying. Butler couldn't have known that his book would be out around the same time as the beheadings of American citizens overseas, or a domestic outbreak of Ebola. Yet he seems to have prophesized both, in a symbolic way, while commenting on the morbid fascination America has with serial killers, mass shootings, and the specter of homegrown terrorism. At one point Gravey — or is it Gravey? — claims his future victims silently and unconsciously call out to him and beg for death. He says killing them is his way of answering "their private screams in the American aloneness." 300,000,000 is precisely such a scream, and America should feel both proud and horrified to have inspired it. Jason Heller is a senior writer at The A.V. Club.